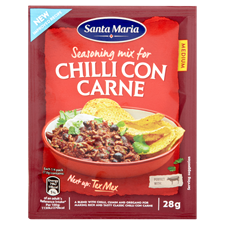 A unique blend of chilli, paprika, cumin and oregano for making real chilli con carne and other Mexican-inspired delights We don't do nasties. We simply blend pure herbs and spices with salt and pepper just as you do in your own kitchen. We're also very generous. So add as much or as little as you want, whenever you want, to whatever you want. Chilli, Enchiladas, Tacos, Burritos, even shepherds pie. We bring the flavours, you add the imagination.